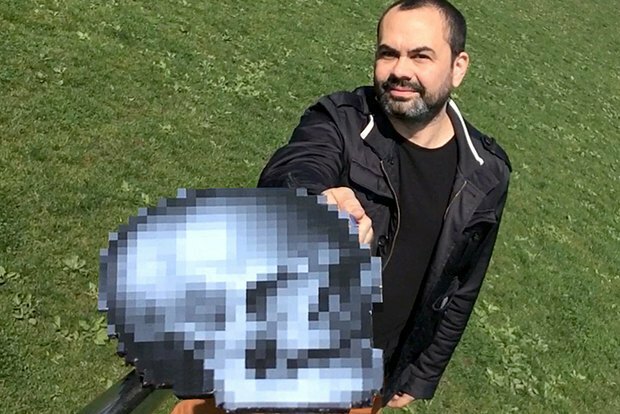 We talk to artist Pablo Garcia about his new project "Memento Mori, and other Selfie Stick Add-ons" that uses anamorphic illusions of emojis and a skull by Hans Holbein. The selfie stick – the ultimate expression of a narcissistic impulse to record and share one's life. But, if one cares to take another view, it becomes a handy metaphor (pun intended) for the computing age and free market capitalism. In its laughable awkwardness, the selfie stick seems to announce: What's the point in owning technology like a smartphone if you can't also pay someone to own a non-essential accessory? The artist Pablo Garcia, however, has quite different thoughts about the selfie. Garcia is interested in old, forgotten technologies as well as new and future media. In the selfie, Garcia sees a technology that disrupts ancient and medieval notions of humility in the face of mortality. Garcia realized that the selfie, as a social practice, was missing something. Sure, it's about you. But you are going to die, ie. Memento Mori. Translated from Latin as either “remember that you are mortal” or “remember (that you have) to die”, the memento mori is part of art history, appearing in woodcuts, sculptures and occasionally in paintings as optical illusions. So it seemed only natural to Garcia that the memento mori could be imported into present day digital technology. 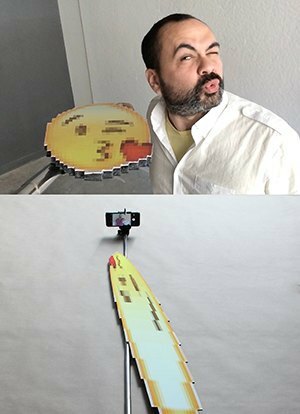 Being an artist of the times, Garcia decided that it would be an “emoji add-on” for a custom selfie stick. Assistant Professor in the Department of Contemporary Practices at the School of the Art Institute of Chicago, Pablo Garcia is trained as an architect. His recent work has evolved from design-for-hire to internationally exhibited artworks, provocations and research studies. 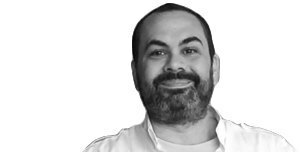 Previously, Pablo has taught at Carnegie Mellon University, Parsons School of Design, and The University of Michigan. From 2004-2007, he also worked as an architect and designer for Diller Scofidio + Renfro. He holds architecture degrees from Cornell and Princeton Universities. To reduce vainglory and self-importance, victorious Generals in Ancient Rome would receive Memento Mori: a constant reminder of the fleeting nature of celebrity and acclaim, and that "Thou art mortal." Derided as "solipsistick" and the epitome of narcissism, perhaps the Selfie Stick needs an accessory to rein in runaway vainglory... More. HOpes & FEARS: First of all, do you think there is, in the the act of taking a selfie, a denial of one's mortality? That people are in effect trying to capture their essence for posterity, or some digital afterlife or eternity? Pablo Garcia: It's a good question. I think there is a strange after effect to staring at one's self over and over again. Six months ago, I wrote an essay about the selfie and, in part, their understandable sides; using them to commemorate events and celebrate the good times. But staring at yourself a lot can warp your sense of time. That fleeting image lasts as long as bits and the internet lasts. It also puts you the subject front and center and tends to obscure the outside world. The selfie's downside is the way the real world disappears in it. A little memento mori could perhaps balance some of that out. H&F: When you had you first encounter the memento mori, and what was it that so fascinated you about it? PG: Years ago, as an undergraduate architecture student, I did a year abroad in Rome. I remember visiting St. Peter's in Vatican City and really stunned by the tomb of Pope Alexander VII. The central figure is a life-size bronze winged skeleton holding an hourglass. To modern eyes this is like a horror movie in the middle of a sacred papal space. But for centuries, art used skulls and depictions of death not for shock, but to remind people of death, mortality, and humility in the face of time's relentless progress. I soon discovered various memento mori tropes, like tempus digit (time escapes; flies), ubi sunt, and vanitas. These are all ways to discuss the incredibly difficult topic of death and our short time on earth. In particular, I was intrigued by the ancient Roman version, which was used to reduce hubris and vainglory in victorious generals. At the moment of their triumphal parade, a slave would constantly whisper "thou art mortal" in the general's ear to keep him humble in his moment of celebrity. I was also taken by Hans Holbein's The Ambassadors, where the memento mori is actually an anamorphic illusion in the foreground of the painting. The skull I use in all my memento mori projects are taken from Holbein's skull. H&F: You like to investigate old forgotten technologies as well as new and future media. Did the Memento Mori Selfie Stick grow out of this type of investigation? PG: I've been experimenting with anamorphic and other optical techniques for some time now, incorporating historical methods into my work. I borrow the geometric methods from some old techniques, like Jean François Niceron's La Perspective Curieuse from 1646. But unlike the ancient minds working out sophisticated geometry by hand, I use software to speed up the geometric processes. Rooted in analog methods, I can quickly create the illusions with a little software and simple physical supplies like paper, foamcore, and paint. To modern eyes, the tomb of Pope Alexander VII is like a horror movie in the middle of a sacred papal space. But for centuries, art used skulls and depictions of death not for shock, but to remind people of mortality and humility in the face of time's relentless progress. H&F: What fascinates you about anamorphosis and distorted perspectives? PG: Two things. It is always amazing to experience the illusion. Something about the unexpected appearance of an image where you don't expect it, right in front of you, messes with your brain, even in this digital CGI special effects world we now occupy. Second, the magic of anamorphic illusion must be experienced in real life. You must be present with the illusion to move around it, find the magic vantage point to decipher the image, and reconcile the seemingly impossible apparition. There is something satisfying for me to know that there are still some remarkable experiences that can still be achieved without technological mediation. It's right in front of you. I guess I just found out about them on the internet—there are lots of websites that delve into that stuff, leaving pretty explicit info on how to retrace their steps. H&F: How did you come up with the idea to pair this memento mori optical illusion with the selfie? They lie so far apart that their fusion in your project is really unexpected but makes perfect sense. PG: The fusion came from a fairly simple observation. I saw some selfies shot with the stick online and noticed that in some shots you could see the stick extending into the shot. Because of my longtime study of the geometry of anamorphosis I saw that angled metal rod as a possible site for an anamorphic illusion. And since I quickly default to the skull illusion as my go-to anamorphosis, I quickly wondered what it would be like to put a memento mori illusion on the selfie stick. I then started thinking about the consequences of putting a reminder of mortality on the controversial selfie stick. To most people I was some lunatic with a selfie stick and some weird thing that kind of looks like a fish glued to it. 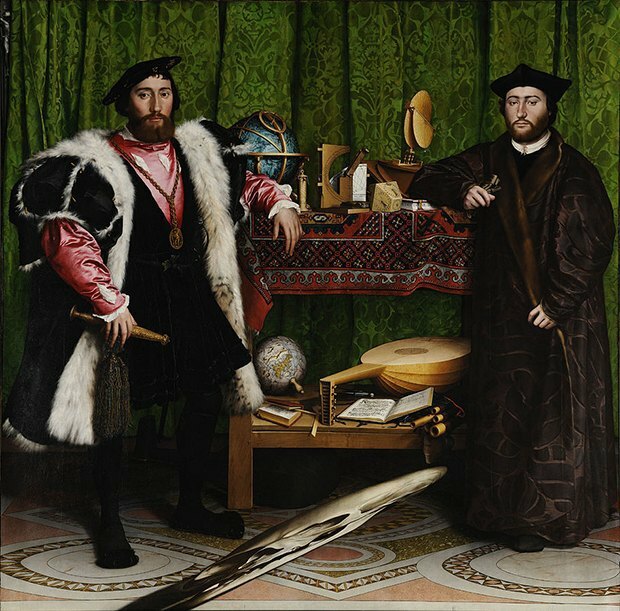 ← The Ambassadors: Jean de Selve Dinteville, French Ambassador to the court of Henry VIII, and Georges de Selve Dinteville, Bishop of Lavaur, painted by Hans Holbein the Younger in 1533 (National Gallery, London ). It is famous for containing, in the foreground, at the bottom, a spectacular anamorphic, which, from an oblique point of view, is revealed to be a human skull. 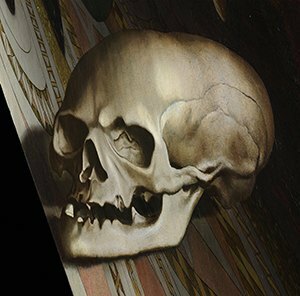 ↑ A higher resolution and more accurate depiction of the anamorphic skull within Hans Holbein's The Ambassadors. H&F: Did you use software here in the interest of time, or more because you wanted to combine the digital to explore something so old and analogue? PG: Both. Software is a way to be expedient with executing techniques. But my work is always in dialogue with analog and digital technologies. Sometimes it's as simple as adapting ancient analog techniques to digital processes. Mostly there is something important to me about keeping old technology and processes alive and to remind digital natives that there was sophisticated technology, albeit analog, in the time before computers. H&F: While the Memento Mori emoji signifies death, you also have some fun with it with the poop, Facebook 'Like' button, and other emojis. Did it occur to you that poop can be a metaphor for death? I'm thinking of Thomas Pynchon here – Gravity's Rainbow in particular, where the infamous coprophagia scene is a metaphor for the death drive that pervades the novel. It seems like this could be another more subversive type of momento mori, though probably not intentionally. pG: Well, the poop emoji is my favorite emoji. Isn't it everyone's? It's so unlike the other emoji for its odd crudeness combined with smiling cuteness. The inclusion of emoji show the possibility in the project to put any image onto the selfie stick. If you find the poop terrifying, so be it. Some people may find the kissy face emoji just as frightening. It may be a gut check the way a reminder of mortality is. H&F: Have people seen you using the selfie stick and asked to use it themselves? PG: You'll notice I didn't do as much outside testing as I could have. I suppose even I feel self conscious running around with a selfie stick. I did it in a touristy area of Chicago (where I live) assuming I could blend in with other stick users. It turns out I didn't have to explain myself. But, of course, that's some of the magic of the illusion: unless you were looking into my iPhone screen, you would have no idea there was an image hidden in plain sight. To most people I was some lunatic with a selfie stick and some weird thing that kind of looks like a fish glued to it. The Eggplant Emoji has been banned as a hashtag on Instagram because it was being used to tag sexually explicit images. Apparently, we've been using a lot of emojis wrong, like the dizzy Star and sleepy face . This is not a high five . The emoji's attempt at diversity had mixed results. A dozen more emojis are coming next year, including selfie, but the middle finger emoji appears to be a limited release. What's next? We asked the experts about the near and far future of emoji.